Pole-Shift Readiness: A Layered approach. When it comes time to retreat to our safe-locations, it is best done in a series of careful steps. This is important so that you are not noticed by your government, police or military. More on this later on in this post. Now many people I’ve had communication with over the years intend to tough-out the Pole-Shift(PS) in-place (where they currently live), this is possible, for example: where the house in question is located in the lee of the wind (out of the wind) perhaps near a rock bluff, a man-woman made berm, or a high and protected by surrounding hills location, etc. Just prior to the PS, the wind will start to carry increasingly heavier particles of asteroid material over a period of about four days: first flying sand, pebbles and then rock sizes up to boulders and larger, this is why you need to be out-of-the-wind which includes your house. Fire is a very real danger as well, so if you live in a forest, best to fell the trees near your house. Of course, I keep saying that your location needs to be hidden! : There is not much sense preparing to stay in your home if situated on a street near a large town, or worse, a city: you’ll be robbed and killed by the desperate and depraved. The latter is true, but if you have a strongly integrated community with your immediate neighbours looking out for each other, this increases your chances of survival in the near After-Time(AT) when social conditions are most difficult. Also, survivor migrants will be carrying diseases, which in the AT without expert help means death in a week or so, so strick avoidance from them is highly recommended. Use waking dreams to direct you. Link to click here for my video where I explain waking dreams. In addition to one’s PS-survival location, there are some very important generally applied things to consider during the run-down to the PS that we are all facing…..
As a precursor, I’ve been (spiritually) shown that I have no less than 5 government agents watching me as I speak, and to that end, I am warning everyone who is beginning to, or has been amassing After-Time (AT) food and equipment over the internet, to take care to mix common purchases with these. In other words, avoid making a series of large purchases: spread them out over weeks, years if you can. The Pole-Shift date is early February 2023, so plan accordingly. Even those purchasing PS supplies (obvious items like 100 lbs of sodium bicarbonate – a.k.a. “baking soda”) locally with a credit card or via a debit card (digital money) should heed this advice. The governments are also watching for those who have declared or indicated their locations, and who have left a digital trail of PS prepping purchases. This is, of course, being done so that they have a database of civilian communities to plunder in the AT. It seems to me that there are at least 6 activities that are critical to afford a smooth transition from full status quo pre-PS societal/family involvement ——-> to your isolated PS & AT community locations. First is your relationships with your loved ones, they need to know where you will be for the PS, as many will not be activated (made aware of the PS) until the “last minute” by U.S. President Trump (I had a dream-experience with him-he’ll do the announcement), but they need to be warned not to mention your plans and location via the Internet in any way. Paper mail is recommended for communication in this regard. Our safe route to our survival locations is an issue as well. For instance, if you have any bridges needing to be crossed while traversing there, you would be best advised to have an alternate route (or two), otherwise plan your timing accordingly or some other method of travel parked on the other side of the river/ravine. The same applies to landslide areas, heavy traffic and/or several vehicles blocking the route (California and New York/east coast residents need to particularly pay attention to this threat), in the last months there will mass exoduses, beware of this. Our purchases over the internet have to be as secret as possible, so a software installation of a “peer blocker” (easy & free download) is recommended (peer blocking works), also, a VPN is recommended so that government agents cannot locate you (a VPN spoofs your location). Regardless, credit card purchases can be tracked, so do as many cash transactions as you can: NO use of corporation point-cards! Now, speaking of cash, there will come a time when cash is the only method of buying your supplies that will be safe. I have been told by my spiritual guides that at some point in the next 3 years, I’ll be doing only cash transactions for my PS supplies, I’ll be notifying all my public interfaces (Facebook, this website & my YouTube Channel) when this occurs. As a re-direct or as a cover, it will probably be a good idea to continue to buy your normal day-to-day stuff with trackable financial methods, namely, credit and debit cards all through your duration while in your (current) government-identified locations. It will also be very important to dispose of your “real estate” investments such as seaside properties, boats, RV’s, fancy cars and airplanes in a timely manner, speaking of which time, I’ve been told to do this by the end of 2020. Also, if you can afford it, it may be advantageous to NOT sell your OLD-PARADIGM objects during this time as a cover, by this I mean RV’s, power boats, etc. Also, I’ve been told that at some time in the next 3 years that I am to take any money I have out of the bank: I’ll also announce this at the time, so stay-tunned. It’s also suggested by spirit that we come to remove our banked-money, to do it over a period-of-weeks or months so that the beast does not awaken. Again, moderation is recommended, so leave some in the bank for local common status quo purchases. A personal note: I recently made a large purchase, and to do so, I removed a fairly large sum of money from my savings account, a few days later I got a call from my bank asking for “feedback” on their bank services: this is a red flag, clearly the banks watch for large withdrawals, so do your cash withdrawals as slowly as you can. Another precaution that I recommend, is to be careful what you say during cell phone use (including browsing the internet) and where you take your cell phone during these next 4 + years. Cell phones also broadcast your location, so the first thing to remember is to turn off your cell phone before you leave to visit your safe-location to drop-off supplies and not to use it while you are there. “I am far from knowledgeable about caves, but there are some obvious factors a person needs to consider. Does the cave in question have soil walls? : that’s a hole in the ground=bad. Does it have all rock walls? =good#1. Does it have stalagmites and stalactites? =Vgood#2. Is it longer (deeper vertically) than it is wide?=good#3. Is it a cavern?=ok Is it a grotto (man made)=bad/good. People have asked this of me many times, and I usually give caves a 50% approval MAINLY because during the Pole-Shift soil around the top of the cave entrance (or rock) can fall and close-off the entrance(or make difficult to exit). The other reason for the 50% approval rating is due to flooding. You can have a high & dry cave entrance (high enough elevation to avoid the seafront assault), but it can accept exterior drainage INTO the cave via a flash flooding (massive rain during the Pole-Shift) OR any sea water that is traversing the landform looking for drainage: remember the sea will be moving beyond imagination, so if one is within, say, 50 miles from the seacoast, it is POSSIBLE for seawater to find that cave. So you have to do your homework on the landform surrounding the cave. Also, reservoirs & dams will break during the Pole-Shift, so you shouldn’t be down-landform from them for your survival camp. Rivers as well can reverse or change direction and find new valleys heretofore that have never seen a river. Don’t give up on this, I get from my spiritual guides that caves, in general, are good safe locations. 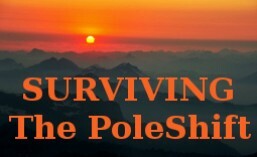 Regarding survival locations: every geographic location has it’s pitfalls and it falls upon anyone considering these locations to become very familiar with local conditions such as: nearby freshwater containment (which will break and release during the PS), rivers that can re-direct their flow, lakes that can drain over the surface and flash-flood ravines, karst areas, landslide-sinkhole zones and fault lines. Channel: All those who are of good heart need not worry about your Life during these times, for many good souls with wonderful technology are watching over you to protect you. Know that all those identified by your over-families are pulling every string to make you safe. Those who are of whom we speak already know who they are. For those in doubt of your protection, they should follow this safety advice to the letter. God loves all, but for those who do not seek God should beware of those around you, for they will be your downfall. ← Guided Meditation Spiritually-Charged to Open your Third Eye. And it is. All I can say is good luck with your Life and God bless.